Visitation will be 5 to 7 p.m., Sunday, October 7, 2018 at Behrens-Wilson Funeral Home. Funeral services will be 11:00 a.m., Monday, October 8th at Trinity Lutheran Church with Rev. Wilbur Holz officiating. Interment will follow at Mountain View Cemetery. Enid Alma (Johnson) Asheim, 96, passed away on October 4, 2018 peacefully at her home. 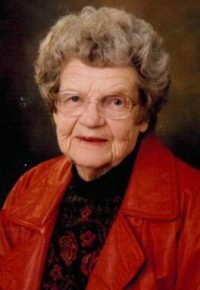 Enid was born on January 29, 1922, to Julius Halvor and Amy May (Leary) Johnson, on the family homestead near Viewfield, SD. Enid was married to Waldemar Lee Asheim on August 20, 1939. To this 76 year union, 5 children were born: Dean, Amy, Kay, Jean, and Trudi. Enid is survived by daughters Amy, Jean (Don Taylor), Trudi (Larry Glassburn), and daughter-in-law Sandy Asheim (Dean), and son-in-law Don Gabriel (Kay), 12 grandchildren, 23 great-grandchildren, and 1 great-great-grandchild; also, brother and sister-law Bernard Dwain and Irene Asheim, and sister-in-law Vena Asheim (Boyce), as well as, numerous nieces and nephews. Enid is preceded in death by her parents, husband, son Dean (Sandy), daughter Kay (Don), son-in-law Larry Glassburn (Trudi), 3 grandchildren, and 1 great-grandchild. In lieu of flowers, donations may be made to Trinity Lutheran Church, and/or Regional Health Home Plus Hospice. Condolences may be conveyed to the family at www.behrenswilson.com.